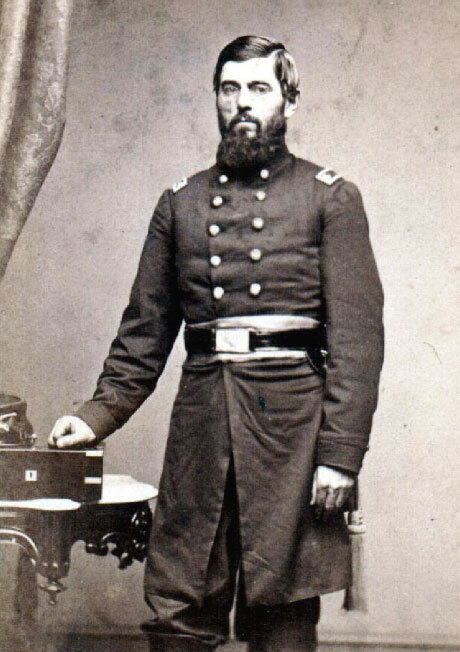 Eric Wittenberg has put up a fine post featuring James Childs, Colonel, 4th Pennsylvania Cavalry, killed at Antietam on 17 September 1862. Elements of the Fourth were among the few Union cavalrymen engaged at Sharpsburg that day – the Federal mounted arm was not a major factor in the battle. Eric’s study – and that distinctive photograph of the Colonel – reminded me of a gap in my digital collection of portraits. In particular the face of the man who followed Childs in command of the unit, his Lieutenant Colonel James K. Kerr. As usual, looking for Kerr led to other serendipitous connections and people … thanks Eric! On the 12th of March, Colonel Campbell resigned, to take command of the Fifth Cavalry, and Lieutenant Colonel Childs was promoted to succeed him. Major Kerr was promoted to Lieutenant Colonel, and Captain George H. Covode [Co. D], to Major. So who’s who in this photograph? The man on the right wearing Lieutenant’s shoulder straps is probably the Adjutant. But I am not certain who he is. Bates indicates Robert L. Coltart (or Coulthart) of Company I was promoted from 1st Lieutenant, Company I to (or mustered into the unit as) Adjutant, 28 December 1861 then to Captain, Company I, 20 December 1862. This suggests he was Adjutant for most of 1862. So I think the picture is of Coltart. Colthart was a lawyer in Pittsburgh in 1860. 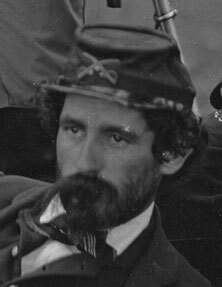 Like others of the Regiment including Colonel Campbell, he had previous Army service in the Spring of 1861 with the 12th Pennsylvania Infantry, a 3-month unit. He’d been 2nd Lieutenant, Company B. 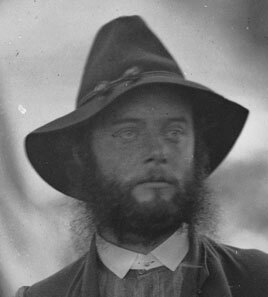 On the other hand, the man could be William M. Biddle, whom Bates reports being promoted from Adjutant to Major on 14 March 1862. He was wounded and captured in action at Glendale on 30 June 1862, and it’s not clear when he returned to service. His veteran cards (part of Bates’ research) only show that he was 1st Lieutenant in Company M and/or the Staff – not specifically Adjutant. Colonel Childs is easy to identify – he’s standing in the center of the shot. The other two men, not so easy. It can be difficult to to tell a Lieutenant Colonel from a Major by shoulder insignia in a black and white photograph. I see oak leaves on both men. Here’s where serendipity comes in. While looking up further biographical information about James Kerr, I found a mention in “snippets” online from Roger Hunt’s Colonels in Blue. The man on the cover looked familiar, and the back flap identifies him as (Colonel) George H. Covode. How do you like that! George Hay Covode (b. 1835) was a Westmoreland County merchant and US Congressman‘s son. 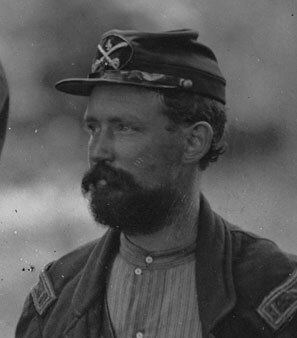 He mustered as Captain, Company D of the Fourth in September 1861. In March 1862 he was promoted to the open Major’s position. He was made Lieutenant Colonel on 8 December 1863, and finally Colonel of the regiment 28 May 1864. He was killed, not quite one month later, in action at St. Mary’s Church, Virginia. Although it may be a slight leap, I believe that leaves the reclining chap as Lieutenant Colonel Kerr [update 3/25/2010: but … see USAMHI photograph in the comments below]. It’s possible he’s one of the other 2 Majors, but Major William Doster was still on duty as Provost Marshal in Washington, and James Trembell (or Trimble) resigned his commission 12 August. It’s circumstantial, but Bates mentions Kerr in command of a battalion of the Fourth on the Peninsula, but not Trembell. I’d appreciate if anyone with ready access to a Regimental on the Fourth could look into Trembell and get more of his story. James K. Kerr had been an “eminent lawyer” since at least 1850 in Franklin (Venango County), Pennsylvania before the War. He was appointed First Major of the Regiment at its organization, and was promoted to Lieutenant Colonel when Colonel Campbell transferred to command the 5th Cavalry in March 1862. He was made Colonel on 18 September following Colonel Childs’ death at Antietam. He commanded cavalry brigades January – March 1863, but resigned from the service on 17 May 1863 for reasons of health. He then returned to the practice of law, establishing himself in Pittsburgh, where he died at about age 52 in 1876. Soon after Gardner took that lovely photograph, those four officers and the Regiment returned from the Peninsula – serving last at Yorktown (to 25 August) – and passed through Washington (arrived 4 September). They were on the way to Manassas, but were not in time for 2nd Bull Run. They did join Pleasonton’s Cavalry Division of the Army of the Potomac on the Maryland Campaign. 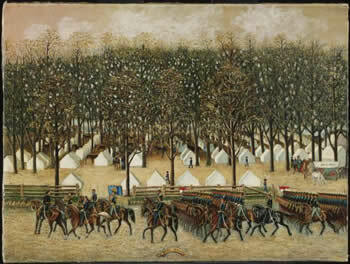 The painting of the Regiment at drill near Washington DC is in the collection of the Philadelphia Museum of Art. It was donated from the collection of Edgar William and Bernice Chrysler Garbisch in 1968. 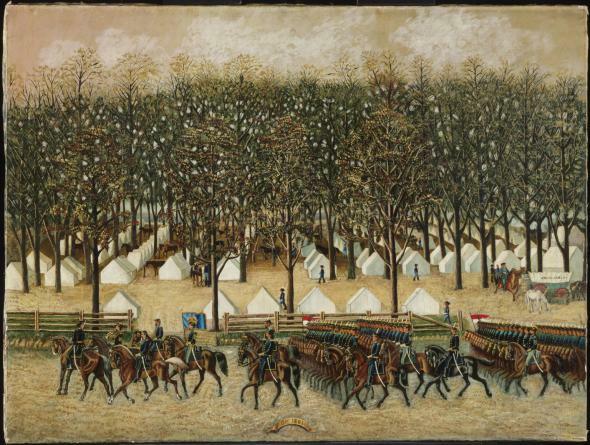 “This anonymous painting shows the newly formed 4th Pennsylvania Cavalry early in the war at its camp of instruction near Washington.” The version posted here is from the ExplorePA.com site. * The quotes above, along with service information about the officers of the Fourth Cavalry are from Samuel P. Bates’ History of the Pennsylvania Volunteers (1869-71). To my mind, the best source for Bates and everything Pennsylvania in the Civil War is Alice Gayley’s comprehensive website. The group photograph of the staff of the 4th Cavalry is by Alexander Gardner, and is found in full glory in the collection of the Library of Congress. The catalog lists it as Westover Landing, Va. Col. James H. Childs (standing) with other officers of the 4th Pennsylvania Cavalry, taken in August 1862. I wonder if “Westover Landing” is named for “Westover“, a house near Harrison’s Landing, Fitz Porter’s HQ in June/July 1862? Or maybe vice-versa. I haven’t found “Westover Landing” on a map, but have seen descriptions of it as “two miles east of Harrison’s Landing”. Adjutant Robert Coltart’s pre-War occupation is found in an 1860 City Directory for Pittsburgh, thanks to GoogleBooks. Kerr’s occupation and death from an 1879 History of Venango County, a portion of which is transcribed online. His location in Franklin in 1850 comes from another County history called Centennial Discourse (1876). The shoulder strap illustration is from the Official Military Atlas of the Civil War (1891-95), Plate 175. I have a couple of printed (reissue editions) copies of the Atlas,and I know it’s online (I just can’t put my cursor on it right now). Colonels in Blue cover art from Harry’s brief review from 2007. If I had come at it from the other direction, looking into Major Covode first, rather than Kerr, I’d surely have found the lovely Brady shots of him at the Library of Congress. Thank you for the kind words about my post. I’m glad that you enjoyed it, and I am likewise glad you found something useful there. Lt. Col. Covode interests me, and I’ve done some work on him. He was MWIA at the June 24, 1864 Battle of Samaria Church, which is fully profiled in my book Glory Enough for All: Sheridan’s Second Raid and the Battle of Trevilian Station. I intend to profile Covode some time in December. Westover Landing is indeed the Westover plantation on the James. It was also a camp for the 6th US, among others, just downriver from Harrison’s Landing. It’s a bit more than two miles by today’s roads, but that looks about right going down the river. The plantation is still there with a sign near the highway, but it wasn’t open for visitation when I was living in Williamsburg. Nice to see you back posting, by the way! Looking forward to more about Col Covode, Eric. Thanks for more about Westover, Don. And one post is hardly a trend … but I hope I’m back. I heard that one minister there had a lot of the writings painted over because of their “ungodliness.” Hope I heard wrong. Grant, Meade, Dana, and their staffs left no tangible evidence of their conference in the churchyard other than O’Sullivan’s photographs. Several of the private soldiers who either were there that day or were treated at the church when it served as a hospital were not as reticent, however. They scribbled their names, and sometimes their units and opinions, on the walls inside the church. Both physically and in images, then, Massaponax Baptist Church serves as a reminder of the warriors who once stood on its grounds. Hi there. Thank you for the information. I don’t know if anyone is viewing this page anymore or not, but I happened across it. I just wanted to mention that my grandfather was in the 4th Pennsylvania Cavalry as a Captain during the war. Neat bit of info. Thanks again! Good afternoon. I have another candidate for the Lieutenant on the right. Lt. Henry King, a fellow townsman and perosnal friend. He was the RQM of the 4th. Childs asked for him as he lay mortally wounded, and gave him personal effects to be taken to Child’s family. He was 43 at the time. I have a picture of his older brother and they compare favorably. I will post again on this possibility soon. I recently discovered that my one of my uncles was Pvt. Michael Sowers. He was a medal of honor recipient during the Wilson-Kautz raid at Stony Creek Station, Va. Date of Citation was 1 Dec. 1864. If you have any more information on Stony Creek Station or the 64th during the raid, i would like to know more. Great site. Thank you. At Hatcher’s Run, on the 1st of December, Gregg’s Cavalry and a battery were engaged, in which the Fourth performed signal service. It was led by Major Mays. A fort near the point where the railroad crosses the run, stood in the way of further advance, and it was necessary to capture it. This duty was assigned to the Fourth. Plunging into the stream. it crossed above, and making a detour, came in upon and attacked the rear of the work, while the front facing the river was held by the Sixteenth Cavalry dismounted. Assailed thus in front and rear, the garrison was soon compelled to surrender. Two hundred prisoners, three cannon, with arms, equipments, and stores were captured. The loss was considerable. Captain Francis M. Ervay was among the wounded. see online photo colonel Kerr, MILITARY HISTORY INSTITUTE. I’m not sure, but he doesn’t look like the person above who I thought to be Kerr. So the mystery deepens a little for me. William Emile Doster is my great grandfather, and I’ve always thought the Westover Landing photograph (he’s reclining) was him, though with little evidence other than resemblance, attire, and that he could easily have visited from Washington, which was not uncommon. Audrey, do you have the book on the 4th PA cavalry? Good info on W.E. 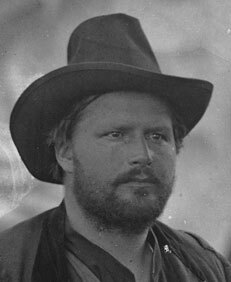 Doster there–he also wrote a book or two himself and was the military lawyer assigned to defend a couple of the Lincoln assassination conspirators. He was my great grand uncle or something like that. Yes, Michael, have read those books. Also have some of the drafts. My father knew most of the family history and kept many records. His mother was very close to her father W.E. Doster. I want to know if there was a John King (1839-1911), a cavalry man, with the 4th Pennsylvania Cavalry (my Great Great Grandfather). He was in all the major battles prior to Gettysburg, but deserted around late June, 1863. He moved to Iowa, where he married and lived out the rest of his life. I have a small copper badge in the shape of a shield with “4” on the top, a “P C” on the bottom. My grandma insisted it meant “4th Post command”, but 4th Penn. Cav. was probably correct. My great-uncle, was Charles H Sherwood, (1842-1864) #2121, grave at Andersonville. He was in the Fourth Pennsylvania Cavalry, Company M (Luzerne County enlistee).I am trying to place his place of capture. I believe it might have been at White Sulphur Springs/Warranton, October 1863. How can I confirm that? is it possible that the adjutant is Duncan Clinch Phillips, who will become captain in F company later in the war, but was a lieutenant in M company, I think, at the time of this photo? Hi everyone, I’m somewhat suspicious that the man lying in the foreground may be my great, great grandfather Colonel James Harvey Trimble(He was a Major at the time of this photo). He bears a great resemblence to my grandfather Foster Abner Trimble. And as far as my research goes it is possible this photo could have been taken in early August 1862 which would have placed my GGgrandfather at that location. He was part of the 64th Regiment 4th cavalry pennsylvania and later was promoted to Colonel of 211th penn. volunteer infanty. 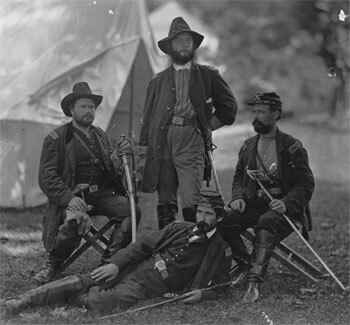 Can anyone tell me how to access the Library of Congress photos of the Colonels from the Civil War?